A 3-page (6-sided) fold-out brochure briefly promoting the 207 GTi THP 175. Issued June 2007 with publication no. 28 page booklet, well illustrated, English text. Dated January 2007 and covers 2007-2009 models. 28 page booklet, well illustrated, English text. Dated July 2007 and covers 2007-2008 models. 16 page booklet, well illustrated, English text. Dated July 2007 and covers 2007-2008 models. 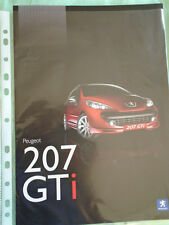 A rare original Peugeot 207 GTi brochure dated Jul 2007. Brochure is 16pp illus in colour and is in very good condition. 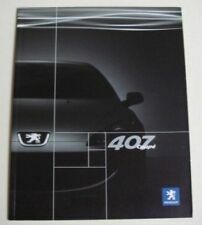 A rare original Peugeot 207 range brochure dated Aug 2007. Brochure is 36pp illus in colour and is in very good condition. 2007 Peugeot 207 GTi brochure. 16 pages and in good condition.Publication Number. This may result in your suspension and I will have no option but to re-list the item. A rare original Peugeot 207 CC brochure dated Jan 2007. Brochure is 28pp illus in colour and is in very good condition. 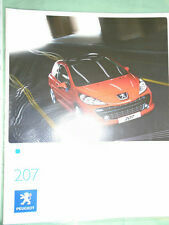 A rare original Peugeot 207 RC brochure dated Apr 2007 with German text. Brochure is 8pp illus in colour and is in very good condition. 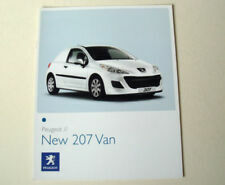 A rare original Peugeot 207 CC range brochure dated Jan 2007 with French text. Dated June 2007 and covers 2007 models. 6 page folder, well illustrated, English text. A rare original Peugeot 207 CC range brochure dated Feb 2007 with Dutch text. Brochure is 28pp illus in colour and is in very good condition. 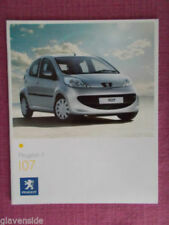 A rare original Peugeot 207 M Play brochure dated Jul 2007. Brochure is 6pp illus in colour and is in very good condition with small creasing to top edge. 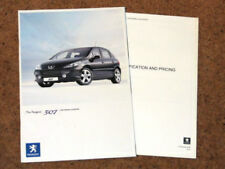 A rare original Peugeot 207 CC range brochure dated Mar 2007 with German text. Brochure is 28pp illus in colour and is in very good condition. 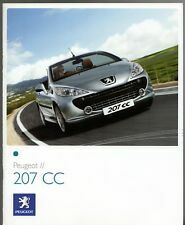 A rare original Peugeot 207 CC range brochure dated Feb 2007 for Swiss market with French text. Brochure is 28pp illus in colour and is in very good condition. 11 page brochure in excellent condition, like new. 6 page folder, well illustrated, English text. 21x30cm approx. 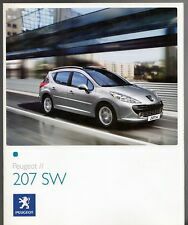 A rare original Peugeot 207 SW range brochure dated Jul 2007. Brochure is 28pp illus in colour and is in very good condition. 8 page booklet, well illustrated, English text. Dated June 2007 and covers 2007-2008 models. Brochure is Size A4 foldout type 6 pages. 207 GTi brochure dated June2007 mcp 2749. 12 page booklet, well illustrated, English text. 21x26cm approx. 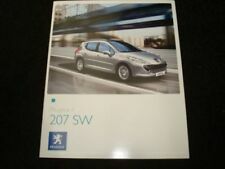 PEUGEOT 207 SW UK SALES BROCHURE. Dated July 2007. In unmarked condition. English text. Covers S & Sport, petrol & diesel models. No dealer stamp. Undated but c mid 2007 and covers 2007 models. 6 page folder, well illustrated, English text. 4 page folder, well illustrated, English text. Dated June 2006 and covers 2006-2007 models. 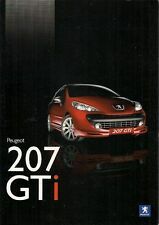 PEUGEOT 207GTi THP175- Preview Brochure June 2007 & 1st Full Brochure July 2007. 36 page booklet, well illustrated, English text. Dated April 2006 and covers 2006-2007 models. 44 page booklet, well illustrated, English text. Dated December 2006 and covers 2006-2007 models.